There were only a few weeks left before the first garden visit once we had completed our two spring projects. This meant that it was time for “spring cleaning”! In a joint effort the whole team works its way through the garden, tidying borders and sprucing up hard surfaces, statues, gates, light fittings and many other things. Here are examples showing some of the activities, and – no – we did not leave all the work to Ollie, our Garden and Grounds assistant! Topping up and raking bark paths. 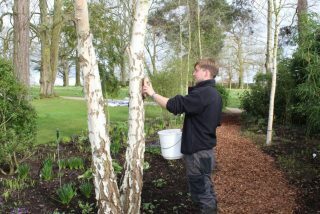 Washing the bark of our silver birches. 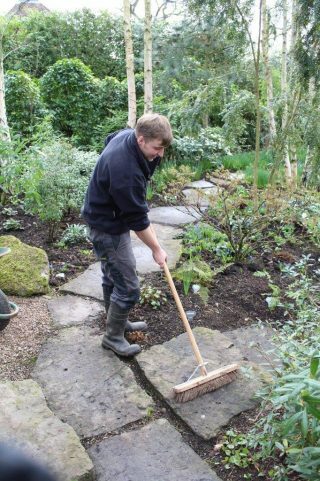 Scrubbing stepping stones in the Stroll Garden. 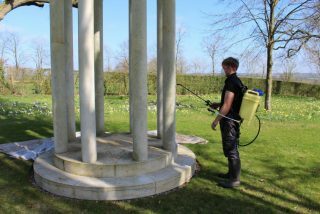 We find that the gentlest way of cleaning stone and wood surfaces in the garden is to spray them with a solvent-free environmentally friendly product (ECOS Algaecide Solution) which removes algal, slime, lichen & moss in one treatment, without the need for scrubbing or washing. We use this product on all garden furniture, statuary, pillars, stepping stones and paving. Cleaning the monopteros in the park. 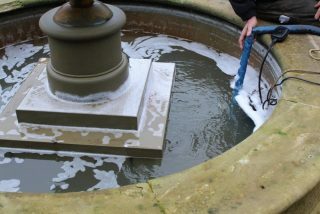 In the South Garden, the fountain is drained and cleaned to remove decaying leaves which would make the brominated water froth. 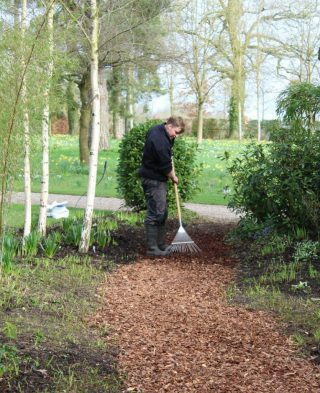 After the borders have been weeded and fluffed up, all gravel paths are topped up and raked. 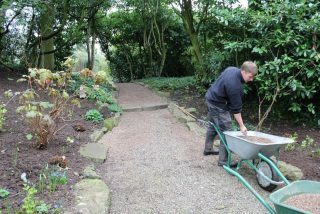 Final touch to the gravel paths. The garden is ready for your visit!